If you want the kids to spend enough time in the bathroom to follow the cleaning rules, make it a place that's fun as well as functional. Because space is at such a premium here, your decorations must be functional as well as pleasant to look at. To this end, it pays to make kids a part of the decorating process. Give the bathroom a theme you can live with, and let the kids choose the colors. Make it fun! These kids bathroom ideas can help get the decorating process started the right way. Use child-safe decorations to make the bathroom safe for wet little ones. Add nonslip bath rugs , non-slip mildew resistant bathtub stickers , and plastic cups for post-brush rinsing. With safety secured, it's time to move on to the playful decor. Choose kid-friendly accessory themes. Kids don't want their bathrooms to have a spa look - that island-of-tranquility bit is not their thing. Consider ducky accessories and soap dispensers and a yellow rubber ducky shower curtain for your toddler. A new coat of paint is the quickest, cheapest, and arguably most dramatic way to give new life to an old bathroom. Don't forget the switch plate, toilet paper holder, and the like. Consider a removable switch plate decal as an easy alternative to tackling the challenge of detail painting around outlets. Accent the bath in contrasting color for a stylish flair. Seal with a clear waterproof coating. Good, calming color choices (blues, greens) can help make mad morning dashes feel less stressful. 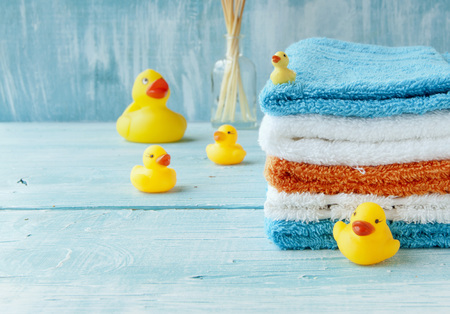 Soft, thirsty, fluffy new towels in a hot new color or seasonal hue will provide not only the update you're looking for, but a luxurious treat for your hands and body as well. Be sure to wash your towels right from the start and they'll stay soft and thirsty for years to come. Replace the shower curtain hooks, too with something snazzier like these steel silver dolphin shower curtain hooks. Why stop at just one bathroom mirror? Brighten up the smallest bathroom by bringing in a new looking glass. This tried-and-true decorating trick makes the room seem larger by reflecting light. Replace old, mismatched fixtures with new, personality-plus styles. Drawer pulls and cabinet handles come in myriad colors and styles. I used a pewter bat-and-ball drawer pull for my son Chris's bathroom. You can buy drawer pulls in whatever sport, color, or animals (the possibilities are endless your child likes to make a jazzy statement on a shoestring. Replace rusted, old, or unsightly faucet and light fixtures. While this is not an inexpensive option, it does make a world of difference. And while you're at it, consider a new showerhead or new faucet and handles for the sink. To make the bathroom seem larger and more spacious, dd a light to this small room. It opens up a small space and adds interest. A recessed spotlight is a low-profile solution. Wall sconces are an elegant choice for half-baths and guest bathrooms. Add a small decorative bud vase and fill it with a flower fresh from the garden to add a polishing splash of color and personality. Now, have fun bringing to life your own kids bathroom ideas!